I’m writing this update from a beautiful reading/quiet room on the 11th floor of Helen DeVos Children’s Hospital, overlooking the lights of Grand Rapids. Jen and Owen are down in our room on the 6th floor getting some much needed sleep. We’ve been at the hospital for nearly thirty-five hours. 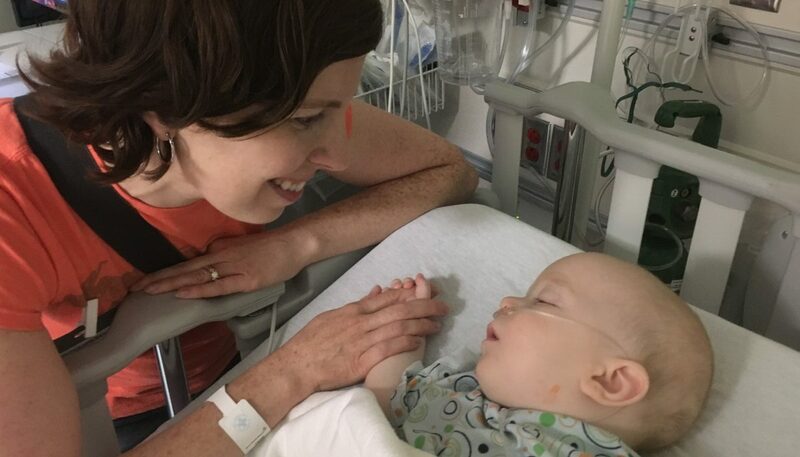 In that time, almost every aspect of Owen’s health has gone as well as we could have hoped for. The surgery took less than three hours and had no complications. Jen and I felt total peace as it was going on; we could feel God’s presence and knew so many were supporting us. The whole procedure was done via scope and required no larger incisions. One thing I had not expected–the surgeon brought pictures to the consultation right after it was over. We saw views from inside Owen’s chest during the surgery. We also saw pictures of the lower left lobe after it had been removed. The difference between the healthy lung tissue and the removed mass was very evident. Owen was extremely drowsy when we got to see him afterwards. His face and color looked great, but he never really came to a full, alert state all afternoon and evening. He woke a couple times when his pain medication was wearing off and cried pretty hard. These were probably the most difficult times of our visit. But the staff were very quick to provide help and give him an additional dose. He was still experiencing some pain this morning but managed a couple smiles. By mid-day, he was back to smiling a ton–something we’re pretty used to with Owen. The chest tube is still in place to drain fluid from around his left lung. They will shut the pump off in the middle of the night, do a final X-ray tomorrow morning, and then remove the tube if everything still looks good. Barring any other complications, we should be able to take him home tomorrow afternoon. I know his brother and sisters are anxious to have him home. And we look forward to being together as a family again.